The V3 Spin Cell was developed through collaboration with industrial design team Nectar Design. The company believes that the Spin Cell could be a game-changer in its market. On their website V3 explains that if one places a 20x solar concentration on a flat, static solar panel then “the temperature quickly reaches 260 degrees F, the solder melts within ten seconds, and the PV fails. 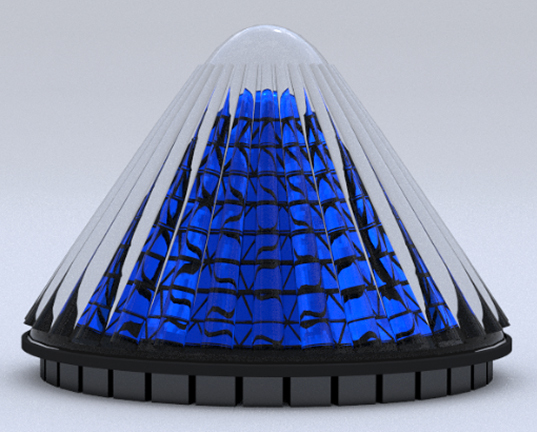 With the same concentration on the Spin Cell, the temperature never exceeds 95 degrees F.”The one meter-diameter cones feature a layer of hundreds of triangular photovoltaic cells positioned at an angle of 56 degrees, encased in a “static hermetically-sealed outer lens concentrator.” The photovoltaic cone spins with the assistance of a “small amount” of its own solar-generated power which feeds a Maglev system, intended to reduce the noise generated by the cones as well as any required maintenance. Additionally, V3 hopes that with the dramatically reduced physical footprint of the solar cones, they might be able to “dramatically reduce the [total cost of ownership of solar farms] making more projects economically viable.” See one of the Spin Cones in action, below.